Offering farm tours, alpaca products, breeding & boarding. 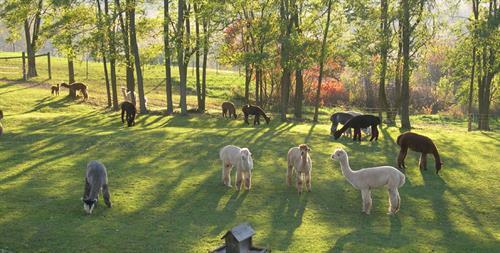 Hemlock Hills Alpaca Farm has been breeding and raising beautiful, high-quality Huacaya Alpacas since 2000. They offer outstanding fiber, hand-spun yarn, as well as finished products; many of the lovely Alpacas are also for sale to expand your breeding stock. A lovely fall day with the girls !